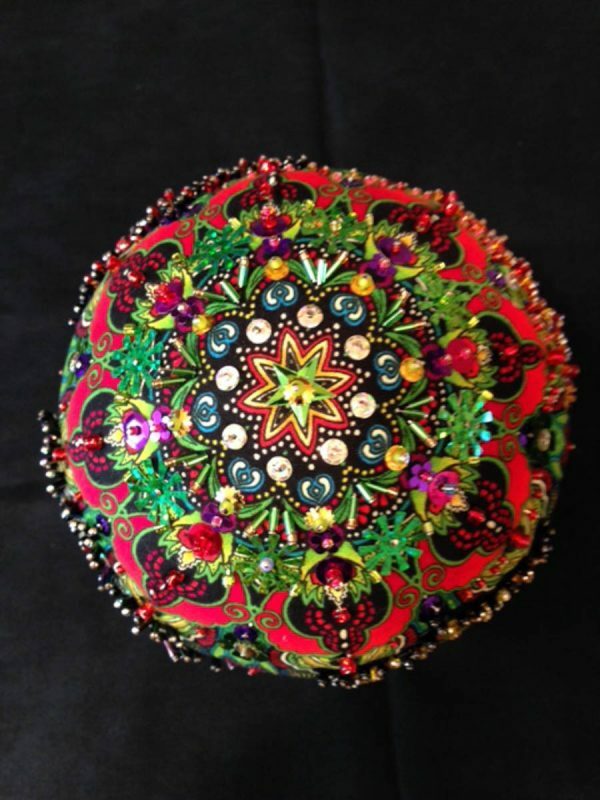 Enjoy the Opulent Ornaments by Paula Nadelstern! Here’s your chance to get in touch with your inner embellisher. 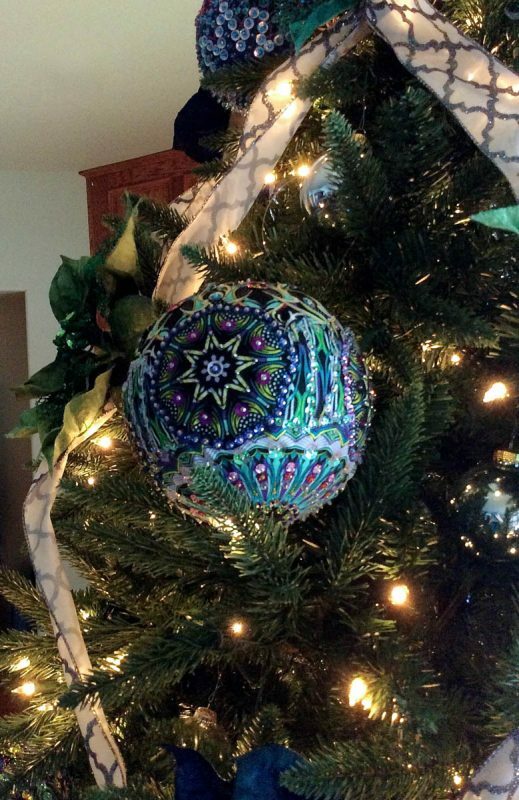 These eye-catching ornaments often trigger nostalgic memories of family members who made some type of embellished Styrofoam ball. This version kicks it up a notch. 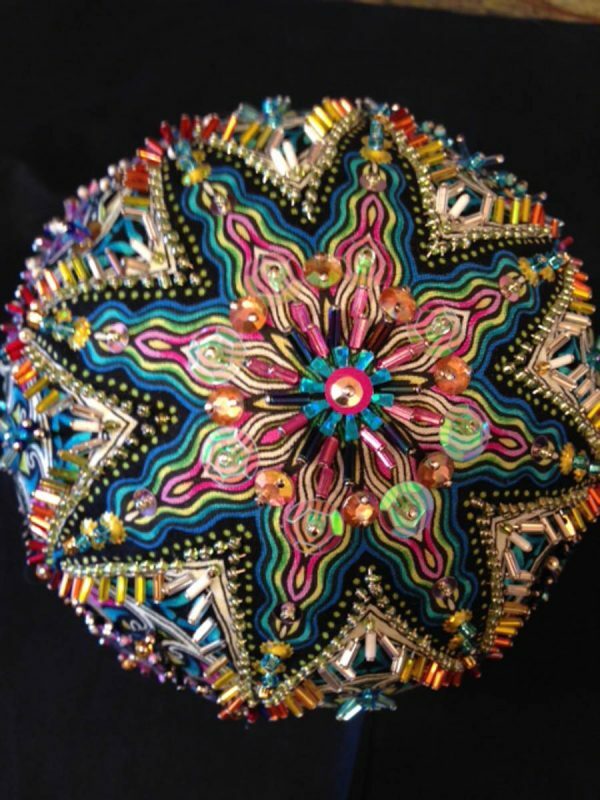 You’ll intuitively rely on the repetitive flow of shapes and colors from a commercial kaleidoscopic or medallion-like print to create this easy-to-make and visually beautiful object, brimming with sparkle and ready to display. It’s all done with regular, inexpensive dressmaker pins, not fancy-schmancy silk or piecing pins. The key is to layer luminous beads with iridescent sequins; I pile one sequin on another for interesting effects. It’s a More is MORE moment! About thirty ornaments—some on candlesticks, others filling a wrought iron basket—spill along the top of a 7 ft. long x 1 ft. wide x 3 ft. high rosewood cabinet in the living room of my New York City apartment. Sitting under a quilt and behind a couch, the unit was built to store rolled up quilts. Here are images of the most recent ones I’ve made with my friend Katherine Knauer. Now I get to introduce you to Karen Selva from Colorado Springs, CO. Karen spent twenty-four years in the Air Force before retiring as a colonel. Her three kids are grown and she works on a variety of craft genres to her heart’s content. 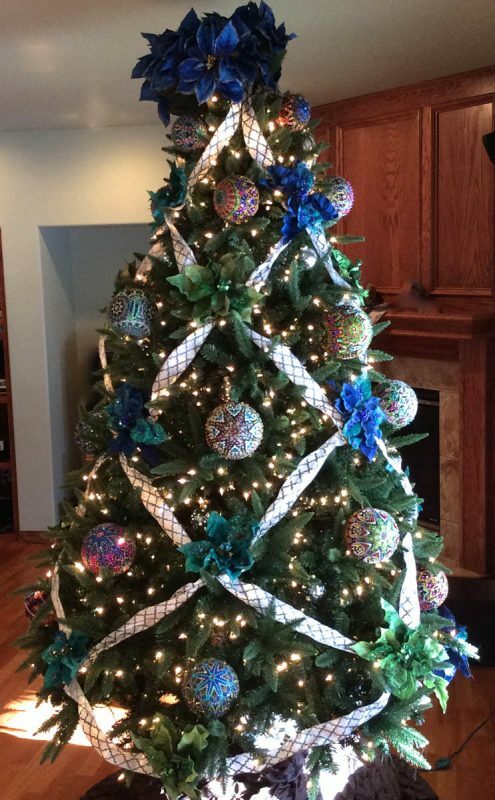 This year, one of Karen’s six Christmas Trees is a fabulous 7 ft. tall tree adorned with twenty-four bejeweled balls. 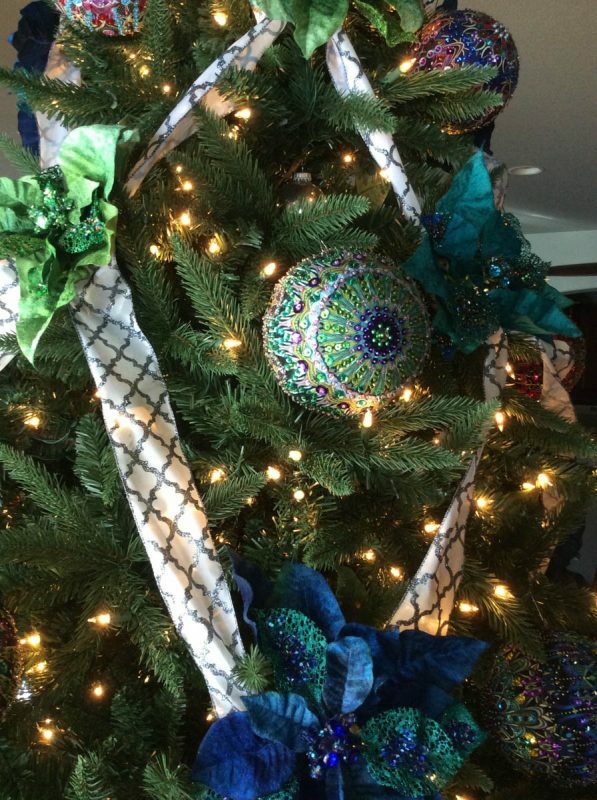 The tree is raised up a foot on a table covered with brown, quilted fabric. Karen started making the ornaments before last Christmas. 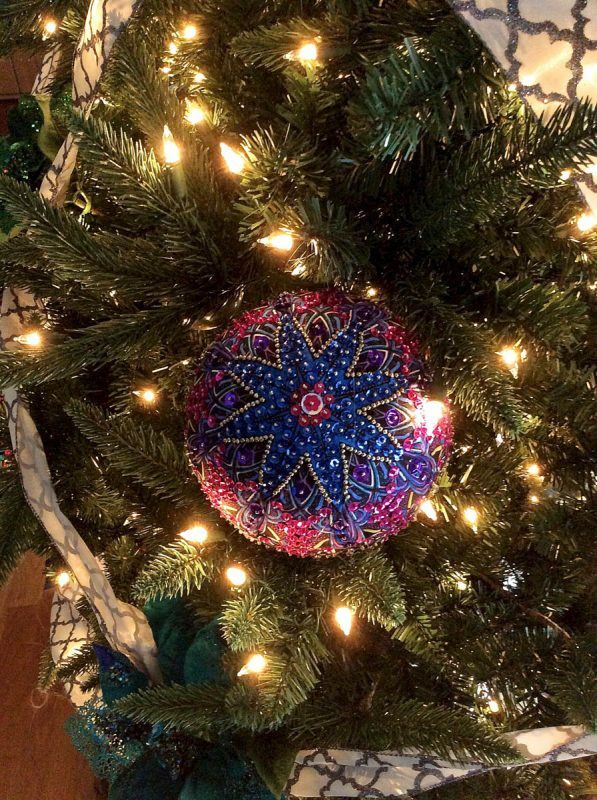 To attach the ornaments to the tree, Karen glued two long 2″ eye hook needles, putting E6000 glue on the needle which is pushed into anywhere on the ball against a sequin to make it blend in. The glue does not go through into the Styrofoam but does firmly connect the eye hook to the fabric. Then she used a regular ornament hook, wrapping it firmly around the tree limb to secure it. To ensure stability, she makes some of the limbs support the larger balls just in case the glue does not want to hold. Please download the instructions: Opulent Ornaments Instructions. You might even find you already have some in your stash. Which spot would you choose for an opulent ornament in your home? A winner will be chosen at random on December 18, 2015 and announced later this week! Congratulations to our WeAllSew reader “rjgosnell”, the winner of the December 17 gift. Enjoy! These ornaments are incredible. I would put them in a crystal bowl as the centerpiece of my dining room table. I think I’d use them as a centerpiece on the table. Beautiful! They are so beautiful that I would want everyone to see mine right away, so I would hang it or them on my dining room chandelier! I would hang it right over my kitchen sink where it would be well lit and reflect in the large mirror over the sink as well. These would be beautiful in the foyer wreath. On the mantel of course. I love these ornaments! I’m definitely going to try it out. I collect Christmas tree ornaments when I travel, now I have something else to work on that is more personal and will be a result of my very own creativity. I’m new to this blog, so can you post instructions or more pics on how you made them? Thanks for sharing! These would be outstanding anywhere I would put them. I would find a place on my Christmas Tree for as many as I could make. In the kitchen window above my sink where I will see it every time I walked by the window. Wow, these are beautiful! I think if I were successful in completing one, I would hang it from our dining room chandelier where I have our Christmas tree. In the entry way. What a nice gift for special friends. These are beautiful ornaments. I would display it at my entry way table. It would be the first thing one would see. Thank you for the imaginative idea. I’d put them in three clear glass tall vases on my dining room table. I would include it as part of a green centrepiece for the dining table. I would put them on the dining room table to enjoy with meals. Gorgeous! I would put them on a tree decorated only with these ornaments. These are stunning!! I would put them on my kitchen window so I could look at them while doing dishes since that is where I tend to spend all of my time. I would want to display them on my coffee table so that everyone coming over would be able to see and appreciate them. They are beautiful. These are absolutely gorgeous! Great project to work on when you aren’t able to be behind your machine or at the cutting table ; ) I would put my ornaments on top of a case in our living room with pine and little whit lights. Thanks for the wonderful tutorial! I have a vase that has a spray of tree branches with ceramic birds. The ornament would be a beautiful addition. Wow! These are beautiful. I would place mine in my glass front china cabinet suspended from the bottom of the shelves. Beautiful! I would put them on display as a centerpiece on the dining room table. I could picture them on an entry way table to welcome guests, but I can’t put them there as I don’t have an entry way. These are gorgeous! I think they could replace a bow on a gift package anytime of the year. I would place it on the wreath that decorates our front door. It would also look great in a grouping on the center of the dining room table, with greenery. They would go on my tree. Maybe the bay window in our living room. I have a triple swag of tinsel at the top of a triple window in the living room. I think one of these Opulent Ornament hanging in between each of the three swags would really showcase these beautiful ornaments. Those or gorgeous! I would set 3-5 of them in a bowl on my coffee table or put them in a centerpiece on my dining room table. It looks time consuming but they are beautiful! I have a glass front cabinet where one would look really nice hung on an ornament stand. The cabinet keeps things safe from my three kitties! Thank you for the lovely opportunity! I think I will have to make several! For the tree, bowl for the table, and to give as gifts. These are so pretty, they could go anywhere in the house, and would make nice hostess gifts…no, I would never give them away :-). I’d like to start with one big one hanging from the chandelier over my dining room table. I’ve already thought of a way to give it extra support. Then I’d start making medium or smaller ones for all my best sewing buds (since it uses fabric) to give them next year. What a wonderful way to use those many beads I’ve collected and Paula’s gorgeous fabrics too. I love that you can make these ornaments to match your color scheme and they don’t necessarily have to be made in traditional Christmas colors to look festive. I would hang them in my windows with a spotlight on them. They would be beautiful hanging from the lighted garland on the staircase bannister. I currently make ornaments using folded fabric and change with the seasons. I incorporate the colors with each room. I even put them in the bathroom. These ornaments far surpass anything I make. It is a joy just to look at them. I would continue displaying all around the house, and particularly around any windows just to add to the glow from the sun. These are stunning! You could decorate a tree with these and white lights – Elegant! I would hang these in a window. I would put them on the wreath on the front door. I would setup a special tree. Displayed as part of a wreath on the front door (out of the elements). 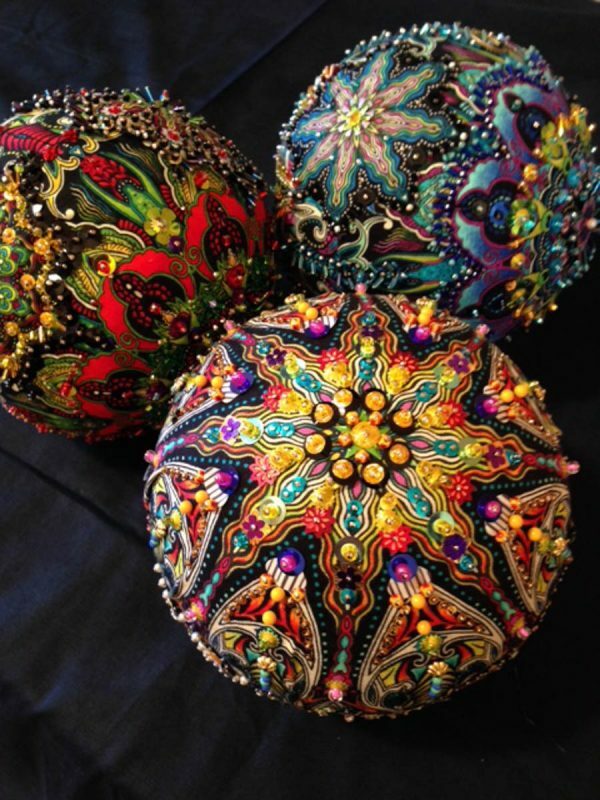 These ornaments are stunningly beautiful! I would put them in a large hurricane glass and use it as a table center piece. Thanks! I loves this! I would make a bunch and display the in a pretty crystal bowl to go on my dining room table. When i was a kid my sister and i had a simular project with a “doll” that we would bejewel her skirt. Good memories. I would put the decorations in the entryway on a wreath above our double doors. These would be stunning in the center of the dining room table in my antique oval footed cut glass bowl. 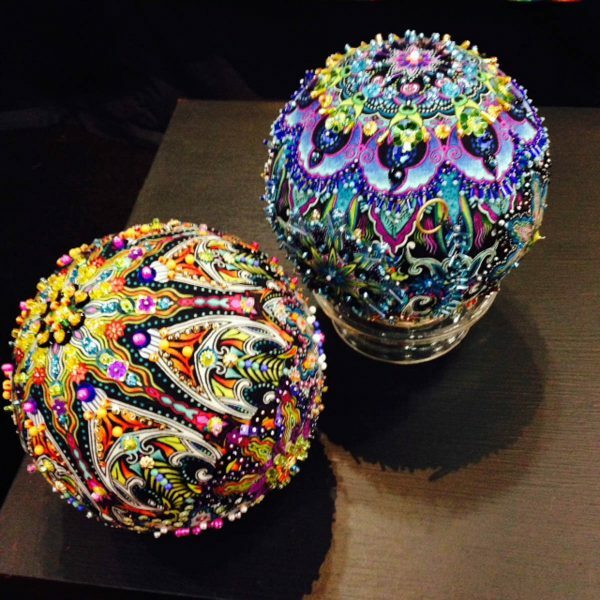 These ornaments are stunning! I would have to have more than one of them but if there was only one, I would have to put it in the center of my dining table with some greenery and ribbon. Wow. I am just speechless. These are the most beautiful ornaments I have ever seen! An ornament like this would have to be the focal point on a tree or wreath. These are just so amazing, excuse me now, I have to go pin them on my Pinterest page so I can admire them in the future! A doorway near my entry is a great place to hang a beautiful ornament, and a twig of mistletoe might bring interesting results. I’d put several in a nest of greens on the cabinet in my entry hall. I would hang them from door knobs as we don’t have a tree. I would put one of them inside my glass door bookcase so I could enjoy seeing it but wouldn’t have to dust it. They would look great on the dining room table in a nice crystal bowl. Wow, those ornaments are really over the top! I would probably hang it either in the pass through in my kitchen over over the entry way into the kitchen. They are just spectacular. Thanks! My mom’s house? Opulent ornaments aren’t really my thing. I’d hang one of the ornaments on the front of my china cabinet so it would be reflected in the mirror. The ornaments are gorgeous! So gorgeous! An ornament like this would get a front and center spot on my fireplace mantel, surrounded by lighted evergreens and nutcrackers! I would make enough to put in a bowl as a centerpiece. These are lovely – I’d like to hang them from a garland on my mantle. I would put a few in a pretty bowl and put on the table. I would put them in a tall vase and put them on my piano. I would display them on my windowsill. I have the perfect place under a jewel tone wall hanging in my family room. We will be able to see it while watching TV. These are just lovely. 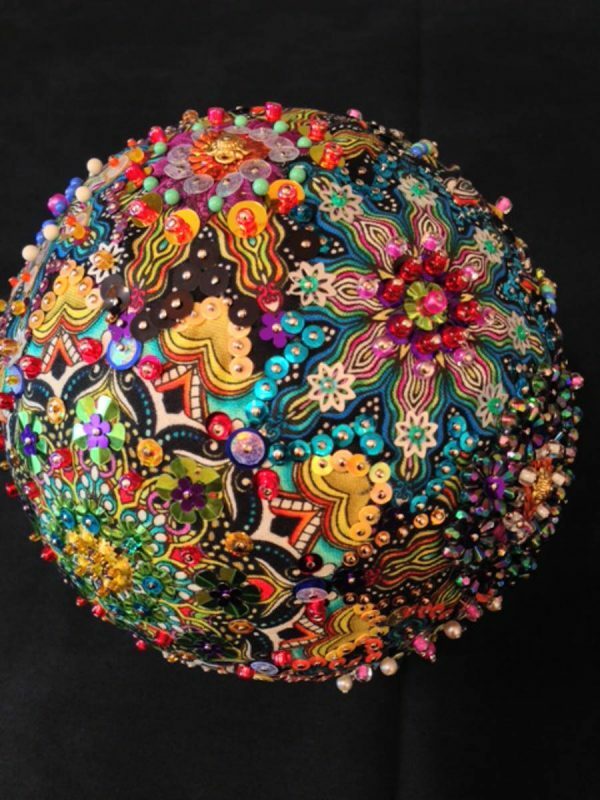 I have a large hurricane candle holder, I would place the balls in it on a coffee table so one could look down on them, but see the colors and sequins from above. Amazing! These would look wonderful displayed in a large glass bowl on the dining table. These are so elegant! They would be lovely on a wreath; I would have to hang it on a wall to be out of reach of littles and pets. Wow! I would use the ornament as a table centerpiece. This is breathtaking!!!!! I sure want to make these and it will be the eye catcher of our Christmas (in the Netherlands) I will place them for my window where everyone in my street can see and enjoy these beauties!! They are gorgeous! I’d have them as part of a centrepiece arrangement on my dining table for Christmas dinner time so everyone could admire them! I would mix the opulent ornaments with my blown glass ornaments and light them with tiny lights. I think these would look great in a wreath on my front door. I am going to make these for next Christmas and put them on my fireplace mantel and give away as gifts. I would use the ornament as a wall hanging. Uuuuhh, call me boring but I would put them on the Christmas tree. I would hang them in a window where the sun could reflect the brilliance. They are gorgeous!! My tree can never have enough ornaments but if it’s too heavy for the branches I simply love the idea of using candlesticks to display them. I have lots of pretty brass ones. Just beautiful! Would use in bowl on coffee table for all to enjoy. Awesome! I a;ways LOVE Paula’s work. I have a bay window in my house that is just calling for one of these. Can’t wait to try making one. Beautiful! I would use them as the center piece on the table. I would have the ornament hanging from my foyer hanging light so everyone coming to my front door could see it and drool ! Incredible! I like the idea of setting one on a cut glass candlestick (I have several) on the mantle in my living room. That way it would be noticeable whenever one enters the room and always visible while in the room. I would place this beautiful ornament in a lighted alcove at Christmas and in the oak china cabinet with other “special collectibles”. Wish I good post a photo here just made one!!!! Karen’s tree is spectacular! I hope someone shows these photos to Martha Stewart! I would display them in a crystal bowl on my antique table in the entry of my home. Those would live in a bowl on my mantel all year around!! Beautiful. I would hang them from my curtain rod in the kitchen so I could enjoy them all day long. I might even keep them on display all year long. outside my front entry, that`s where I would hang my lonely ornament. I would make the ornament hang as the center of the wreath above the fireplace. The lighting would make it sparkle. Exquisite! Such creativity which is not my strong suit. Is there a detailed video or instructions about how to accomplish creating the opulent ornaments? My display vision is to arrange several on a long, rectangular clear glass dish and place in the center of the table. I would hang the ornament with the mistletoe over my dining room doorway. I think they would be beautiful on my mantle. I’m on it!!!!! I would hang my ornament at the top of the tree so it could have a special place. Stunning! I’d put them in a glass bowl in my foyer. 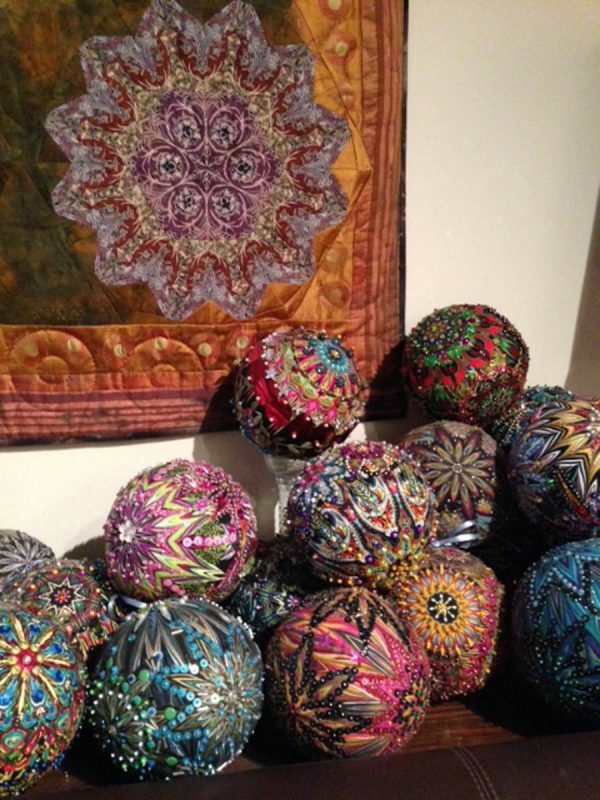 Like violet, I would love detailed instructions–is the fabric glued to the styrofoam ball first? By strips, or some other method? Please disregard my request for the instructions–I see they are there, and quite detailed. Thanks so much!! These are just beautiful! I would love to hang several in front of a long wall mirror in the living room, to be reflected on all sides and displayed throughout the room. I love these ornaments. I do remember making them as a chielld but they were not nearly this pretty. I would make several and display them in a crystal bowl on my dining room table. Wow, are they stunning! I’d honestly have to say they’d look good in somebody else’s house after I made them. Great gifts! Besides, with a kitten, a puppy, and the older dogs and cat, ornaments are NOT happening in my house in 2016! 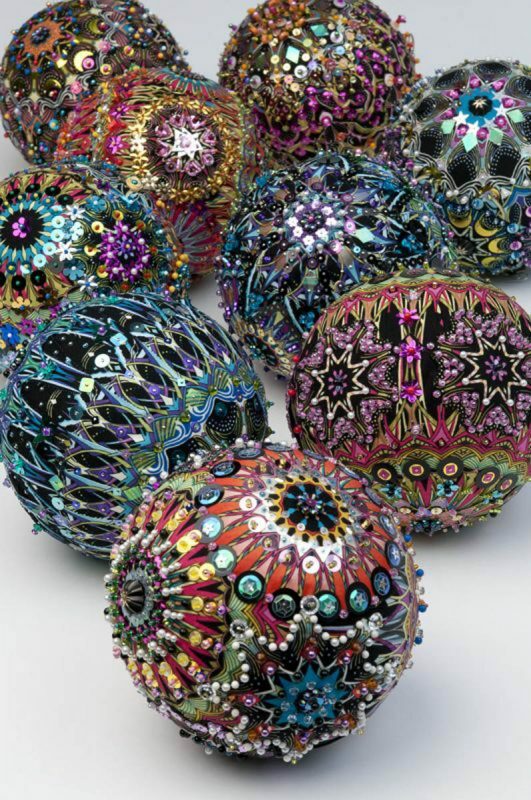 I have done some styrofoam ball ornaments before but not like these. 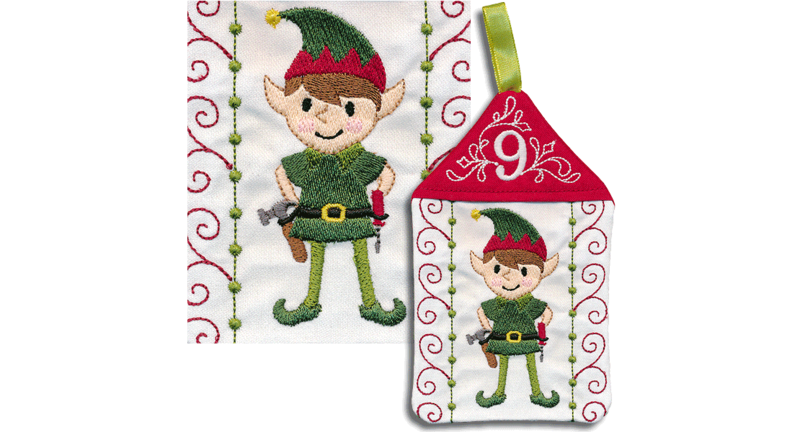 I eould love to make some to hang on my Christmas tree and to make some for family. Just beautiful. I would hang them in front of my living room window, each one suspended by a different ribbon. on the fireplace mantel for all to see on Christmas eve..A fire below and the beauty above. I’d like to make one to hang from the wardrobe door handle in our guest bedroom, so our Christmas guests know we love having them! These are so beautiful. I would put one in my foyer so everyone entering my front door wood get to see it.